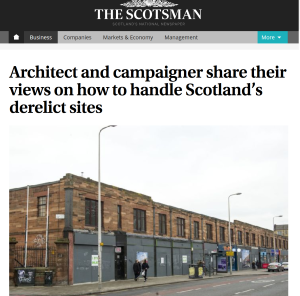 The Scotsman has featured the opinions of Edinburgh architect Dr James Simpson and Save Leith Walk campaigner, Ian Hood, as they share their views on how to handle Scotland’s derelict sites following the announcement that Scottish councils are to receive new powers that will allow them to order the sale of ‘eyesore’ derelict sites. Architect James Simpson: I was brought up in the old burgh of Duns, then the county town of Berwickshire, and I have lived for forty three years in the Edinburgh ‘village’ of Stockbridge. I love town centres and the living and working communities that occupy them. Sir Patrick Geddes pointed out a century ago that towns are complex living organisms and that keeping a place and a community in good heart requires care, skill and continuous vigilance. Property ownership is an important factor in the mix. Owners have rights, but they also have responsibilities. When an owner is clearly neglecting not just a property, but also the interests of the community in which it is set, it is entirely reasonable that its sale should be enforced by the Council through a compulsory sale order. As an architect and a conservation activist, I have always been conscious of ‘eyesores’, derelict sites and vacant buildings. They all detract from the quality of a place and every one is a missed opportunity in environmental, social and economic terms. Securing a change of ownership cannot, however, be an end in itself, it is just the beginning: unintended consequences are an ever present risk. Essential to a good outcome will be active engagement of the community, usually through the Community Council and local groups, and clear, proactive use of the planning system to ensure not just a minimum acceptable standard, or the replacement of one sort of eyesore by another, but positive improvement in physical terms…. … It is important that purchasers should not sacrifice quality as a consequence of having paid too much for a site. It is, I understand, intended that Community Councils should be encouraged to maintain registers of vacant sites – including ‘aerial gap sites’, where buildings have been reduced to a single storey – derelict or disused land and empty or underused buildings, and to submit lists of sites suitable for Compulsory Sale Orders to Councils. Save Leith Walk campaigner Ian Hood: Compulsory Sale Orders could be really helpful for grassroots organisations like the ‘Save Leith Walk Campaign’. Giving councils the power to buy up derelict land and buildings could put more pressure on developers to listen to local campaigns and would even provide a last resort option for local councils to ensure that new development partners have a chance with much better proposals. Save Leith Walk is currently challenging developers, Drum Property Group over their proposals for the demolition of an iconic long and low sandstone building at Stead’s Place on Leith Walk. The building is popular locally with thousands of people objecting to its demolition. Its replacement with a monolithic 600 bedroom student residence and hotel complex when there is a desperate need for social housing in the area has worried many locals. The campaign has identified many major material considerations, in plain English, flaws in the plans that are likely to lead Edinburgh Council to reject the developer’s plans at a planning hearing later this month. However the developer has been terminating the leases of the local businesses who have kept the property alive in recent years and the remaining few are on notice. All the empty properties have been boarded up and are slowly being covered with graffiti, one by one. Despite interest from local artists and entrepreneurs for short term lets, the developer has refused to grant any new leases. The developer says that this is so they can have ‘vacant possession’ as soon as planning permission is granted. An alternative view would be that given the option of a long term derelict site or the developer’s plans perhaps the council would reluctantly side with the developer.